Corporate and recreational video is on the rise, consuming 30-60% or more of WAN budgets. How do you address related performance issues, while enabling new video training and communication initiatives? 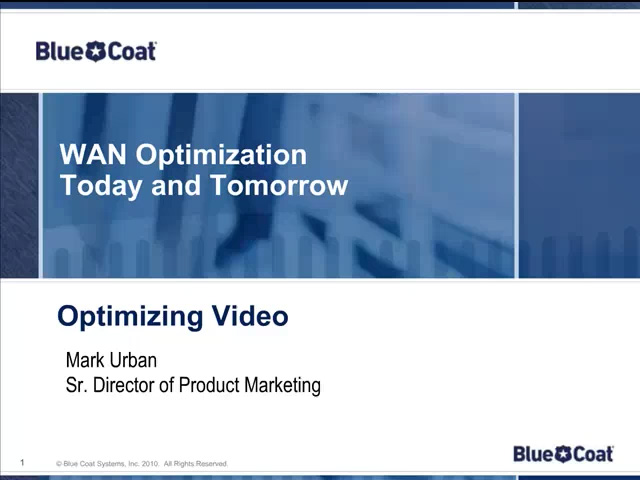 Learn how Blue Coat’s technology uniquely optimizes video. Live video stream splitting can scale WAN bandwidth by 2-10,000X. On Demand content can be served locally from video cache, drastically reducing bandwidth consumption. Gains quickly add up when you have multiple regional offices accessing centralized video content.